Hwy 101 mile marker 65a. 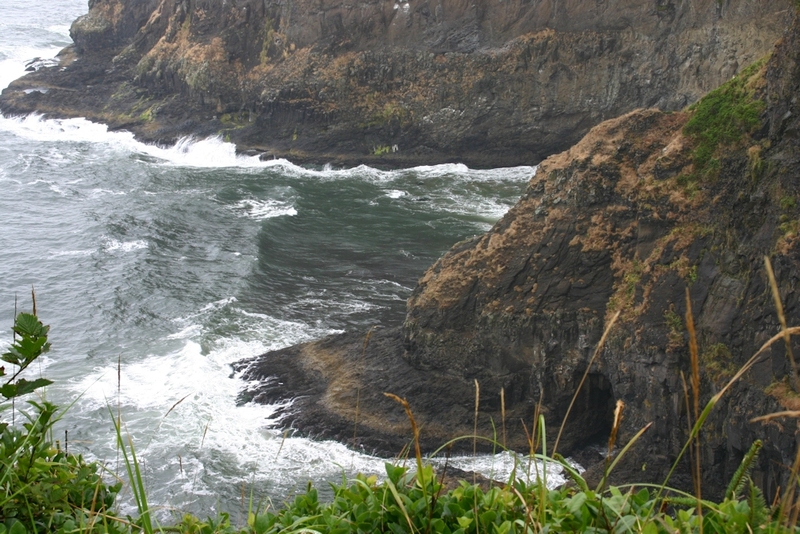 Cape Meares Park is found on the "Three Capes Loop", to the West of Tillamook. Start in Tillamook, taking hwy 131, which is marked as "Three Capes Loop". Turn right on Bayocean rd (See the sign below). You will travel along Tillamook Bay, eventually reaching Cape Meares "Lake". Taking a right turn here on "Bayocean Spit" leads to the Bayocean Peninsula County Park, with walking trails that lead to Tillamook Bay or beaches. 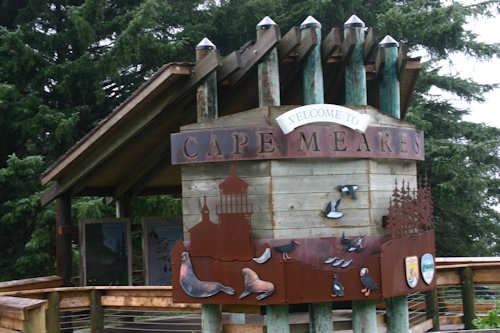 To reach Cape Meares Park, turn left on Bayshore dr. The Park is about three miles from this turn. Cape Meares contains Oregon's shortest lighthouse, which is open April 3 - October 31. NOTE: If you take the right turn as described below, you will be able to only be able to go to Cape Meares Beach. But the road labeled "Park Entrance on Bayshore Road" is closed, and you can't reach Cape Meares Park. A mudslide has washed away the road and repairs are planned. 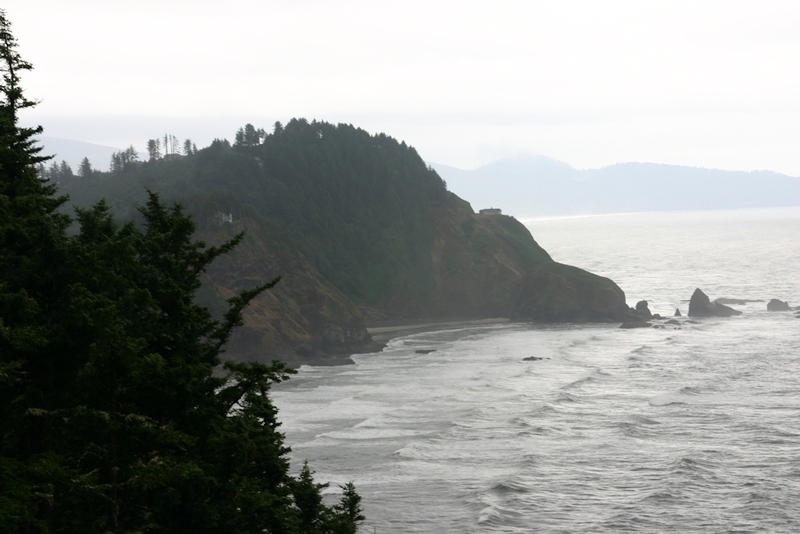 You would continue on hwy 131 to reach the southern entrance to Cape Meares Park, near the town of Oceanside. This is as of February 2015. Please see the "Oregon Parks link" below for details. Three Capes Scenic Loop entrance. Take this right to reach Cape Meares Beach. 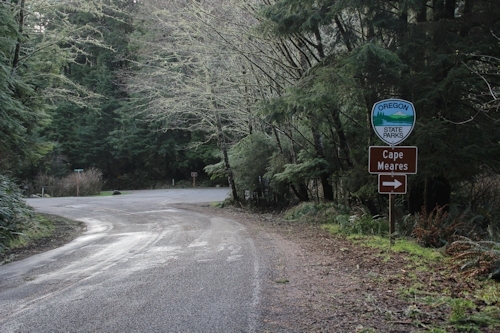 To reach Cape Meares Park, Oceanside Beach, and Cape Lookout Park, continue straight on hwy 131. The parking lot, being about 500 feet above sea level, provides some excellent views from its north and south viewpoints. A large expanse of coastline can be seen to the south. The lighthouse is accessible by way of a short hike down a tree-lined walkway.